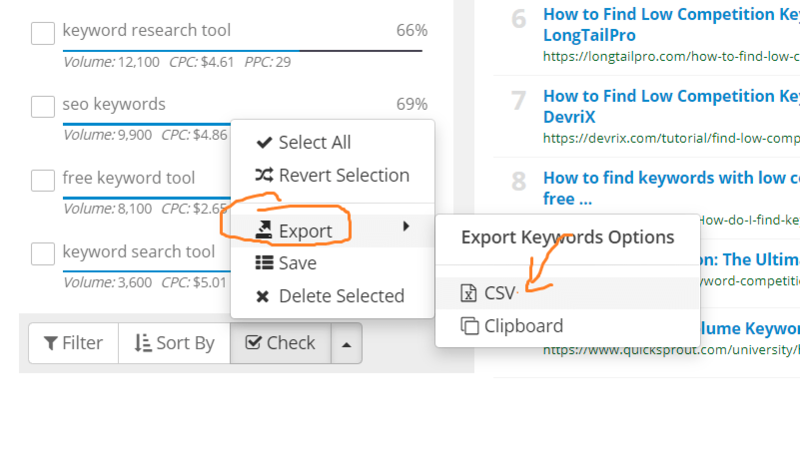 In this post, we’ll see how to find low competition high traffic keywords with Semscoop (aka Keyword research tool). There is no rule stating that you should not target seed keywords(Short tail keywords). 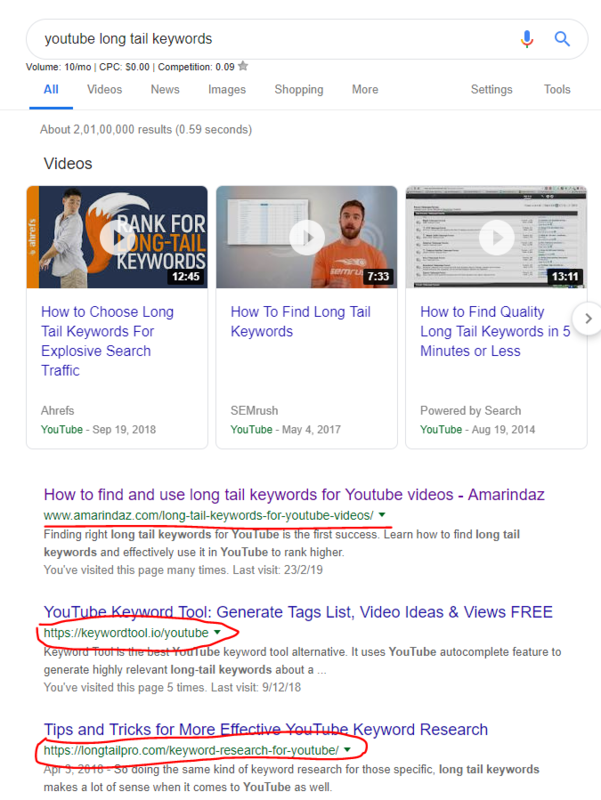 Definitely, you can target for the short tail keyword but when you go for short tail keywords, search volume is very high and competition is also very high. It’s very hard to outrank blog post having good domain authority, page authority, backlinks, domain age. Also, the conversion rate is very low in the short tail keywords compared to long tail keywords. There are people who just pick a keyword comes to their mind and start writing a blog post. That era was gone! Now before start writing the first letter of your blog post, you should exactly determine the competition. Most of the professional bloggers are spending a lot of time on Keyword research than writing a blog. Sharpening knife before one cuts wood is not a waste of time! For example, if you target for keyword “bike“, traffic volume for the keyword is 1,500,000 searches/month. You would think that you will get 1,500,000 views if you write a blog post for the keyword “bike” as 1,500,000 people are searching for the keyword every month. You must know about the competition. It’s 0.78 out of 1. Moreover, 2,19,00,00,000 post is trying to rank their page or blog post for the keyword “bike”. It’s really tedious to compete with 2,19,00,00,000 post. You should know the tactic of adding a few keywords relevant to your topic along with seed keyword and make it as long tail keywords. When you add keyword “second hand sport” along with your seed keyword “bikes”, your competition gets reduced by 40%. Only 6,05,00,000 is trying rank for this keyword compared to 2,19,00,00,000. But before picking the keyword “second hand sport”, you must know how many people are using the keyword to find the product or content related to your new blog post. Also, you should know how many posts are targeting for that keyword. Nowadays, the competition is steadily increasing for the long tail keywords as more people started focusing on long tail keywords. So, you should know exactly how to find low competition high traffic keywords for your blog post to rank your content on Google easily in a short span of time. Let me show you step by step approach of finding low competition high traffic keywords with Semscoop keyword research tool. How to find low competition high traffic keywords? 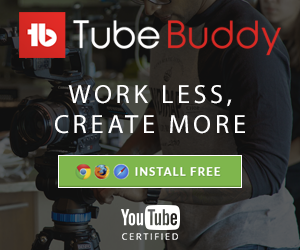 Before moving on, let me show you how I found low competition high traffic keywords like “YouTube long tail keywords” and how I outrank high domain authority websites like Keywordtool and longtailpro easily with this technique. Go to Semscoop keyword tool page. Enter your seed keywords in the search box. If you want targetted traffic from a selected country, you can pick the respective country from the drop-down and language as well. If you don’t have any location constraint, you can set it to default “All Locations” and click on the search button. Let’s say you are targeting for the keyword ” find low competition high traffic keywords“. Semscoop gives you the competition, search volume, domain authority of the top-ranked domains for the keyword, domain age, number of referring domains and content length needed to rank in the first page of Google search result. It gives you the exact metrics needed to be on the first page of Google. 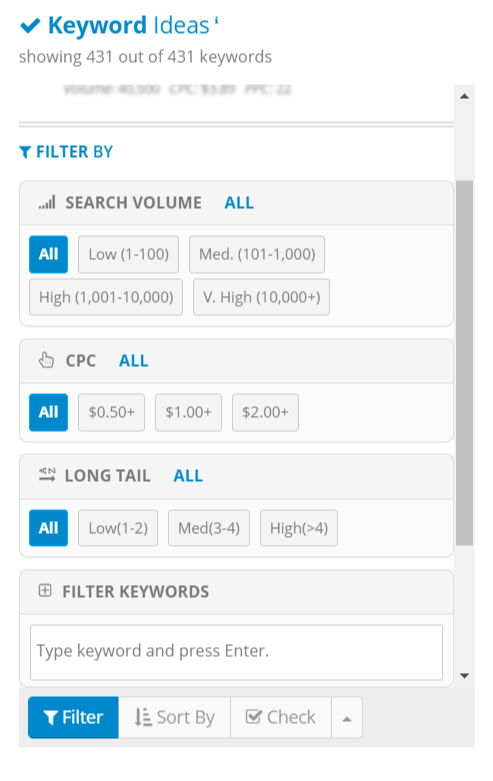 Also, it gives you the keyword trends over months along with search volume. Let’s say you decided to go for this keyword for your next blog post. You need to satisfy the below points to spot your blog post on the first page of Google. Keyword competition is 52– very high. If you have niche site related to this keyword definitely you can go for it. You need 60% domain authority. It’s Moz domain authority which reflects the ability to rank on a search engine on a scale of 1 to 100. Domain age represents the length of time your blog(domain name) is registered and active.11 Years of domain age is needed to rank for this keyword. 564 referring domains needed. Referring domain is nothing but a number of backlinks linking your blog post URL. Your blog post word count should be greater than 2004 words. It came up with these metrics by analyzing the content, profile strength and social engagement of top 10 results for the keyword “find low competition high traffic keywords“. Let’s analyze all the tabs one by one. On the top search results tab, you can find info such as domain authority, domain age, page authority, page age and content of size of top 10 results. It gives you clear information about the domain level details of the page. 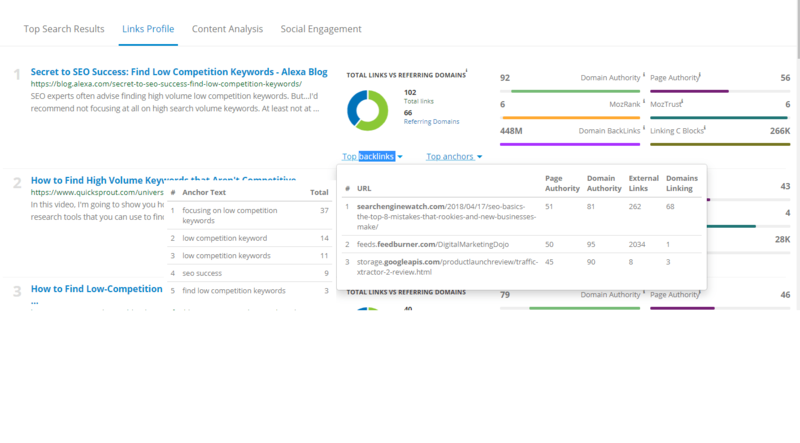 In the content analysis tab, you can see the on-page SEO for the keyword in all search results. Semscoop check for the keyword ” find low competition high traffic keywords” on page URL, title, description, metadata, h1, h2, h3, and image alt text. If you have a look at the below image, on page SEO for the top 2 results are not so good! If your blog post does contain targeted keyword on the URL, title, description, metadata, h1, h2, h3, and image alt text then there is good chance to find a spot on the first page of Google. Count represents the number of shares, mentions or likes for the page. e) Go or no go for the Keyword “find low competition high traffic keywords”? You have enough metrics on your hand to make a clear decision to go or no go with this keyword “find low competition high traffic keywords”. All you need to do is just compare your blog metrics with these data! If you think that you can outrank the existing blog post then can go for it or find related keywords in the Semscoop and go for it. To find related keyword ideas, you can make use of the keyword ideas section on the left-hand side. 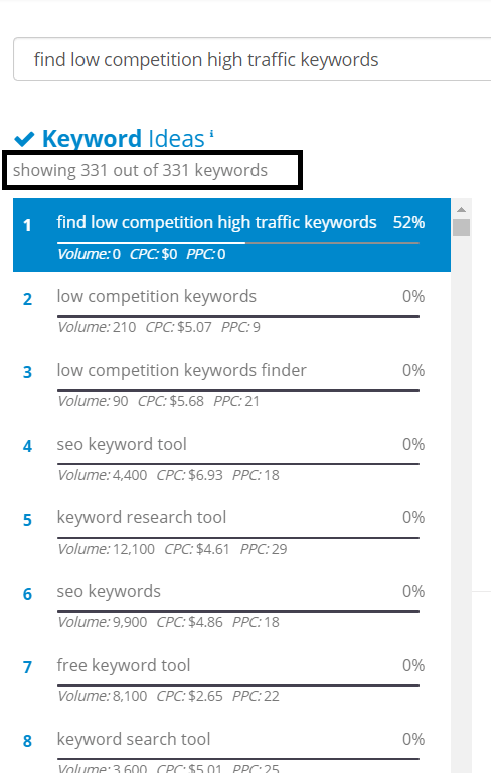 For the given keyword “find low competition high traffic keywords”, it listed 331 keyword ideas related to it. You can tap any of the keywords and respective metric details will be displayed. If you feel hard to scroll up and down then you can export it as CSV and do the keyword research on the Excel sheet and come up the few keywords list. Rinse and repeat the same step until you find “low competition high traffic keywords” for your next blog post. Click on the Filter option at the bottom, select the word count(Under LONG TAIL) and hit the done button. You can explore the LSI(Latent Semantic Indexing) keyword using this filter option. LSI keyword is a kind of keyword which is semantically related to seed keyword. Let’s say you are looking for a bunch of keywords related to “weight loss”. 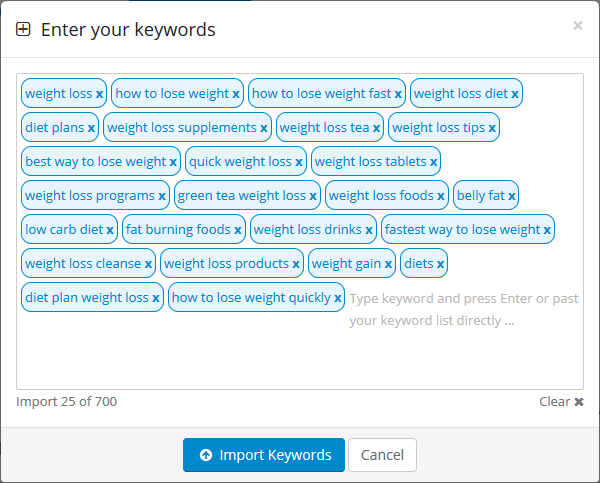 And you are curious to know what keywords people are using in the “weight loss” niche other than the keyword “weight loss”. 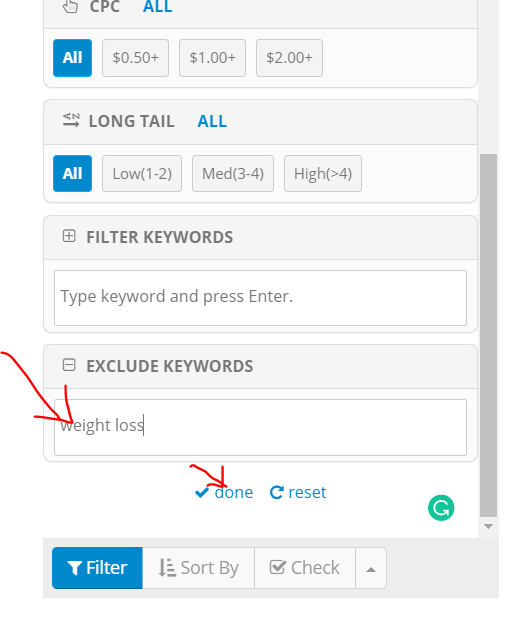 To find LSI keywords, you can type keyword “weight loss” in the search box and click on the filter option. 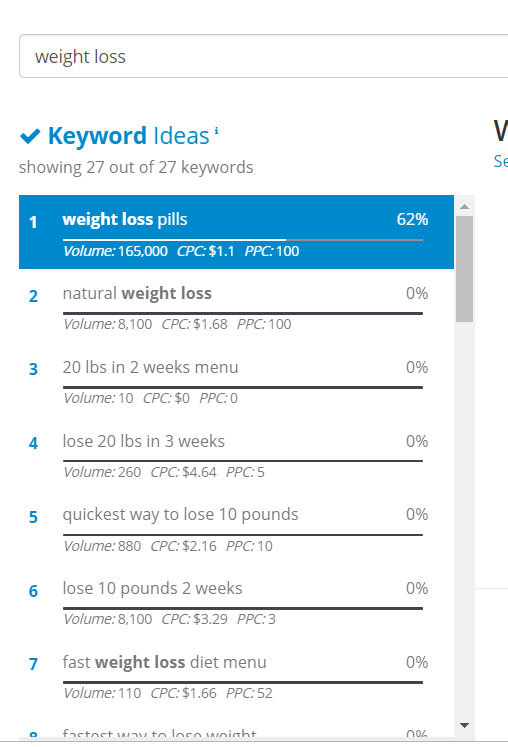 In the exclude keywords, enter the keyword “weight loss” and hit the “done” button. 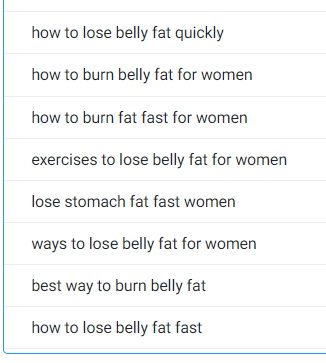 You’ll get a handful of LSI Keywords which doesn’t contain term “weight loss” but related to weight loss. Let’s say you did research on your own and found a list of “low competition high traffic keywords” in your hand. If you want to find the SEO metrics for the keywords, you can easily do that with the “Import keywords” option. Go to Semscoop keyword page, click on the Import keyword option and enter the list of keywords separated by a comma. Click on the “Import keywords” button. Note: You can import a maximum of 700 keywords at a time. You can analyze these keywords in the same way as you did for keyword ideas.